In late June 2017 House Bill 704 called for the creation of a joint legislative study committee in order to study the process of dissolving and breaking up school districts. Its primary sponsor, Rep. Bill Brawley, is now co-chair of the Joint Legislative Study Committee on the Division of Local School Administrative Units. Opponents of the committee feel it is an unnecessary task for a variety of reasons. First, the idea is fraught with potential constitutional violations. 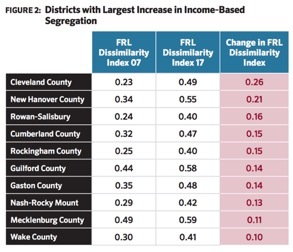 Many Democratic legislators see it as an attempt to directly target and racially segregate two of the largest school districts in the country, Wake County and Charlotte-Mecklenburg schools. Despite initial strong opposition in both districts, merging city and county schools in the Raleigh and Charlotte areas back in the 1970s effectively integrated schools and, as the districts started using a shared tax base, improved school quality drastically. When HB 704 passed, Brawley pointed out that, while there are laws in place to combine school systems, there are none that dictate a process for breaking them up again. According to Tim Lavallee, vice president of the WakeEd Partnership, school districts wishing to break apart with the permission of the General Assembly simply need to file a bill with their legislators. Advocates of smaller districts often point to the enormous operating costs and less control over education in larger districts. In a presentation to the committee, the Department of Public Instruction proved the opposite; based on their projections, splitting school districts would lead to higher costs and less efficiency in schools’ transportation, insurance, administration and nutrition programs. These statistics have not phased Brawley—or the other vocal Republican members of the committee, Speaker Pro Tempore Sarah Stevens and Senator Dan Bishop. When DPI section chief of transportation Kevin Harrison surmised that splitting Wake and CMS would require between 111 and 336 buses each, at a cost of between $9.4 million and $28.5 million, Brawley called his statistics “misleading.” Bishop also refuted the numbers, saying that large school districts would use their buses faster and need them replaced sooner. After two meetings of this committee, with at least one more planned, it is clear that Rep. Brawley is simply shopping for statistics that will prove his point.